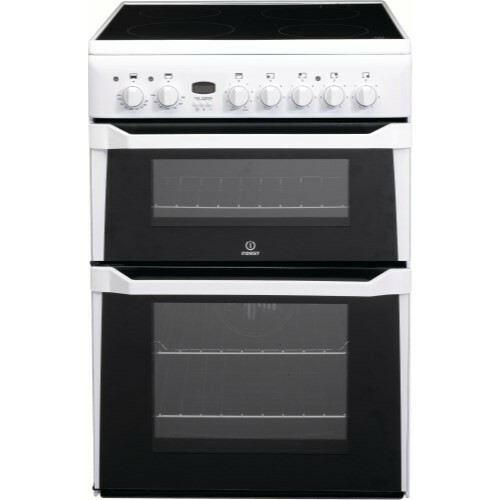 The Indesit ID60G2W Gas Cooker, in white, has two conventional ovens, one with a large 81 capacity for cooking main dishes, while the secondary oven has 32 litres with an integrated grill inside. Double glazed doors make it cool to touch on the outside, while an interior light means you don't have to open the door to view inside and let any unnecessary hot air out. A minute minder with LED display will help you keep a track of your cooking time, so you hopefully don't burn anything.The gas hob gives you instant, variable heat, just use the dial controls on the right to control the flames. There are four hobs with enamel supports and for safety there is flame failure device that cuts the gas supply if the flame has been accidentally blown out. An enamel interior means that this cooker will not give you much grief when cleaning as it will easily wipe clean. An A+/A energy rating will also help to save you money on your energy bills.